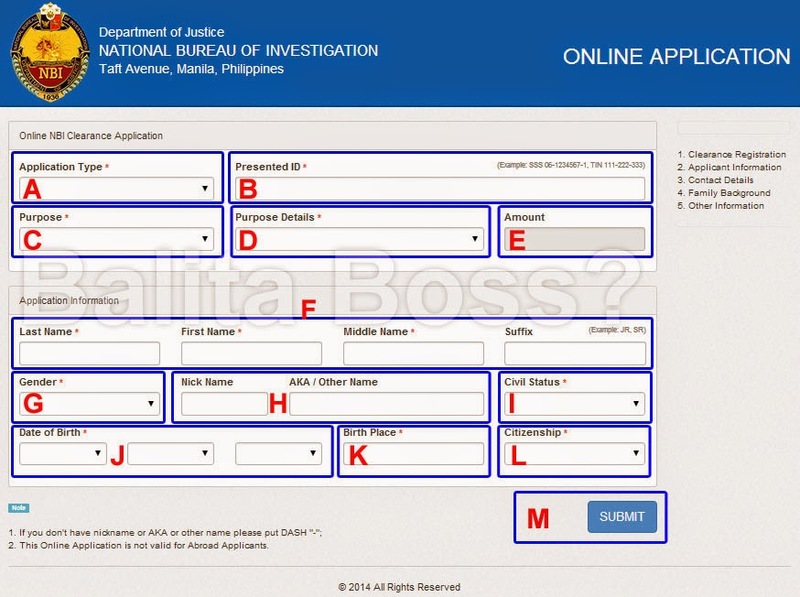 How to Apply New 2014 NBI Clearance Online - Balita Boss! Applicants for National Bureau of Investigation (NBI) clearance can now apply and fill out the complete form online, the Department of Justice (DOJ) announced last January 22, 2014. According to DOJ’s press release, applicants can access the NBI Online Clearance System page through www.doj.gov.ph/nbi or www.nbi.gov.ph starting January 24, 2014. Fill in the online application form correctly and accurately. You are encouraged to take your time filling out the application. Select from drop-down menu the Application Type, whether NEW or RENEWAL. Enter your SSS number or TIN in Presented ID field (Example: SSS 06-1234567-1, TIN 111-222-333). Select from drop-down menu the Purpose of your application, whether LOCAL or ABROAD. 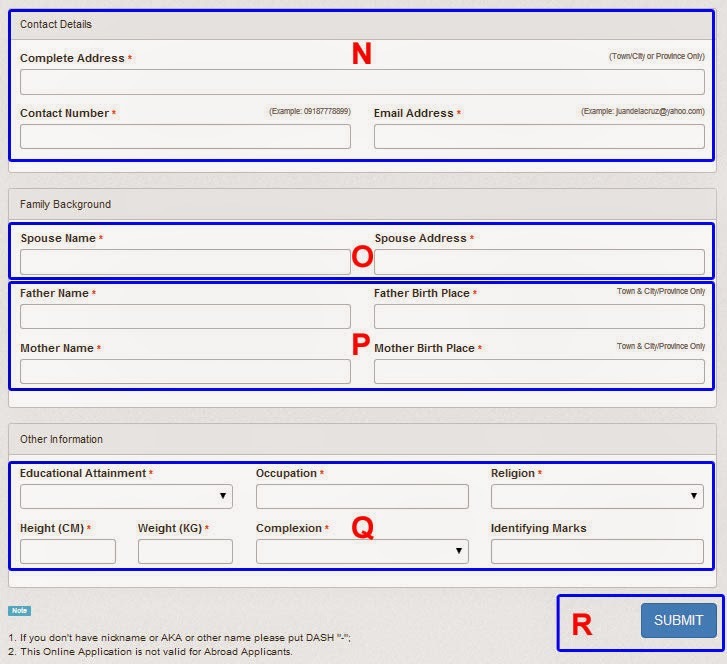 In the Purpose Details field, select from drop-down menu the purpose of your NBI Clearance. Fill up the following fields with your Last Name, First Name, Middle Name and Suffix if any. 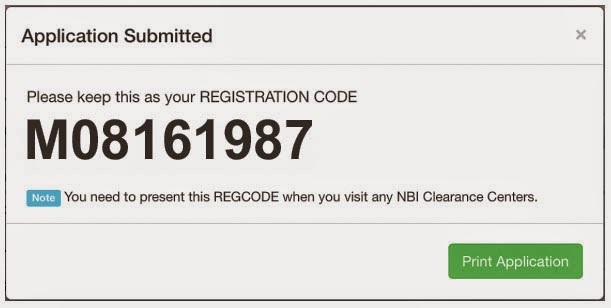 Make sure that whatever you’ve entered in the NBI Clearance online application form is what will be displayed in your copy of the NBI Clearance. Add your Gender in drop-down menu. Fill up the form with your Nickname, AKA or Other Name. (NOTE: If you don't have nickname or AKA or other name please put DASH "-"). Choose your Civil Status through drop-down menu. Enter your Date of Birth (Month, Date, and Year) from drop-down menu. Fill up the Place of Birth field. Choose from the drop-down menu provided for your Citizenship. Click the SUBMIT button to open the remaining steps. The next step is to fill-up the fields for Contact Details. Type your Complete Address, Contact Number and Email Address. The next area is for Family Background. Type your Spouse Name and Spouse Address. Click the SUBMIT button once again to submit your NBI Clearance application online. Once you have completely filled out the online form, you will receive a Registration Code which looks like the image below.